Popularized by Washington Irving in the early 1800's, a Knickerbocker was a term given to the ancestors of the Dutch settlers that populated New York City. The term Knickerbocker soon after became indelibly linked to anything and everything to do with New York. 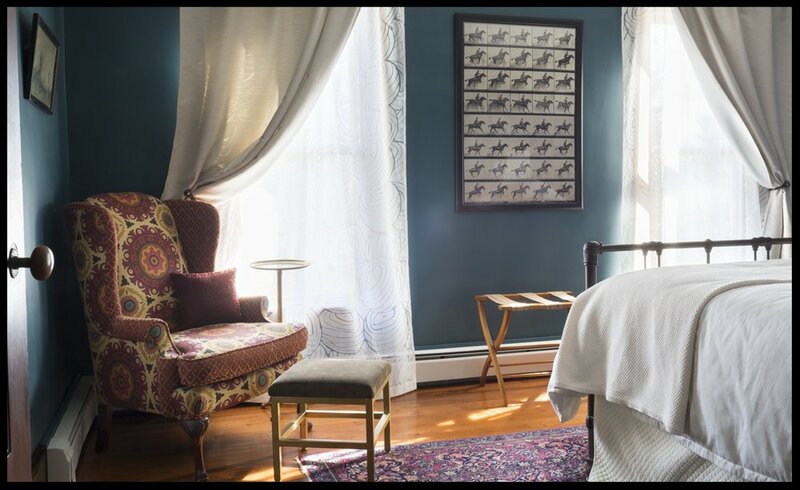 The Knickerbocker room brings together city style with country charm. Bespoke features include a vintage inspired wrought iron bed with hypoallergenic queen size latex mattress, ladies vanity, custom upholstered wing back chair and en-suite bath complete with custom tiled shower and vintage inspired fixtures. This east facing room allows you to enjoy the morning sunrise with a cup of coffee from a private veranda. New York became known as the Empire State shortly after the opening of the Erie Canal in 1825. Inspired by the greatest public works project in North America, the Empire room is our way of paying respect to the growth of a nation in the state we love and call home. The Empire room features a hypoallergenic queen size latex mattress with a handmade upholstered headboard. 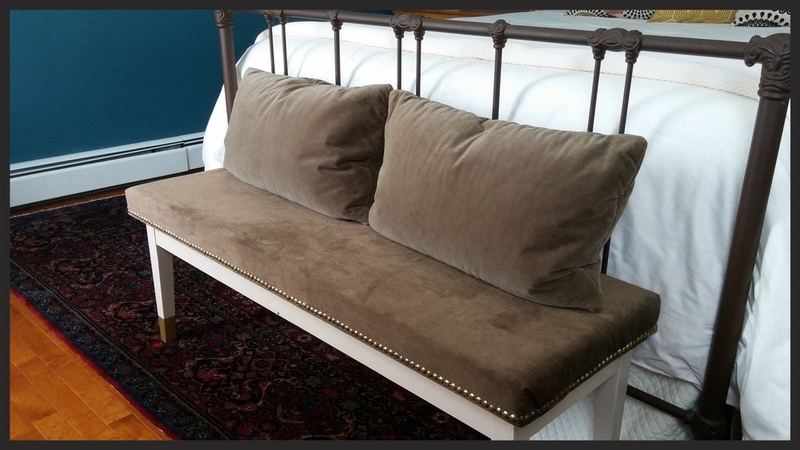 It is appointed with vintage furnishings and New York State photography and artwork. 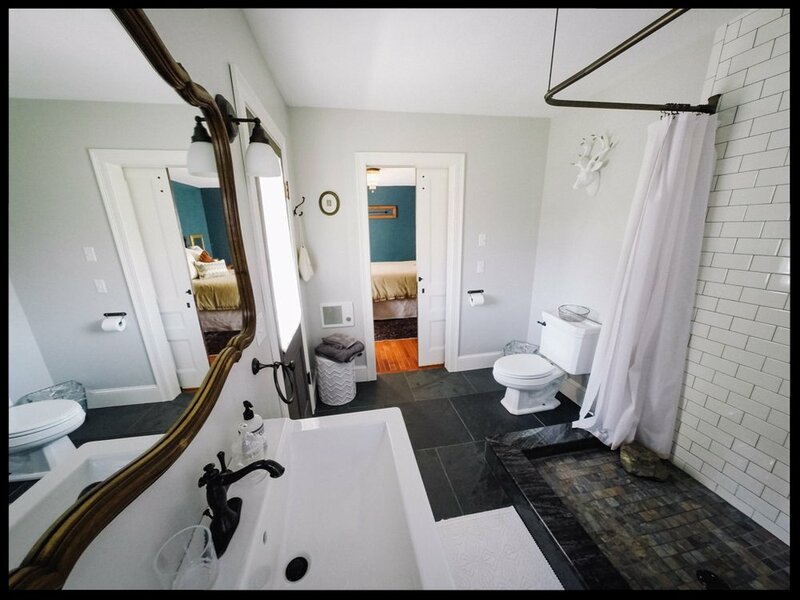 This room also has its own luxurious en-suite bath with brown marble flooring, custom classic subway tile shower and vintage brass fixtures. Low Season (November 15th to April 30th): $135 per night, plus tax / double occupancy - max. 3 persons, 3rd person is an additional $30 per night. Adjective 1. Ever Upward: Motto of New York State, adopted as the NYS motto in 1778 the Excelsior room features soaring cathedral ceilings with beautiful views of the property. The room includes a hypoallergenic queen size latex mattress, writing desk and luxurious en-suite bath featuring carrera marble, herringbone wood floor tiles and a custom classic subway tiled shower. Positioned facing the west, on a nice evening be sure to watch the sunset from your private spacious deck. Low Season (November 15th to April 30th): $135 per night, plus tax / double occupancy - max. 2 persons. This room pays homage to the Roosevelt family, including two of America's finest Presidents and former New York Governors; Theodore and Franklin Delano. From establishing the National Parks system to ushering in the New Deal, the Roosevelt family has left an indelible impression that won't be soon forgotten. 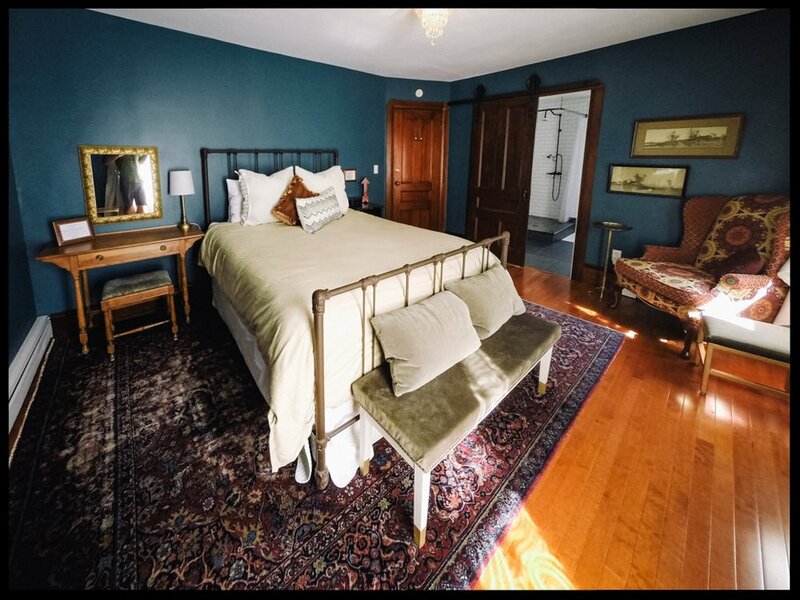 The Roosevelt room is located on the 1st floor next to the dining room and features a hypoallergenic queen sized latex mattress, ladies vanity and a very comfortable leather chair. This room also has an en-suite bathroom featuring vintage tile flooring, large shower and modern lighting.